UNO offers tons of programming that help create a positive college experience for students, faculty, staff, and the community. New students are officially welcomed to campus in a special ceremony. This features remarks from campus administrators, and a dinner afterwards. Durango Days kicks off your college experience at UNO. Students look forward to involvement opportunities, social/service activities, live bands, other entertainment and free food. UNO’s Homecoming is an opportunity to support your Mavericks and show your school spirit. It is a week of fun and engaging events that will pump up your #MavSPIRIT and bring you closer to your peers. The Health & Wellness Fair is presented by the Wellness Center as part of its ongoing effort to inform, educate and empower the campus community to adapt a healthier lifestyle. Prep week and final week can be overwhelming. Luckily, students can look forward to a week of fun events and opportunities. On the first Wednesday of every month in the Weitz CEC, the Office of Civic and Social Responsibility (OCSR) partners with local nonprofits to provide service opportunities to UNO students. UNO sponsors days of service to give student volunteers a chance to engage in service projects around the community. A collaboration with Multicultural Affairs, Department of Black Studies, American Muliticultural Students, and more to offer cultural programming during the month of February. Students can make a wellness goal with a specific action or activity to start the new year and win prizes in the process. An excellent opportunity for students to connect and interact with recruiters from a variety of companies. The pow wow, which is a celebration of history and culture, features musical performances, arts & crafts displays, and a winner-takes-all dance contest. The festival, free and open to the public, celebrates unity in diversity and promotes inclusion. Lavender Graduation is an annual ceremony to honor lesbian, gay, bisexual, trans, queer, asexual,and ally (LGBTQIA+) students and to acknowledge their achievements and contributions to UNO. 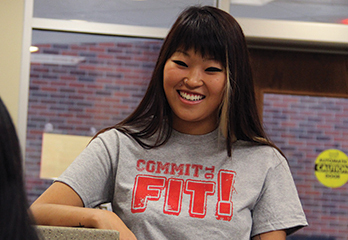 Commit To Fit is a great way to make and keep your New Year's Resolution.